MasteryConnect is proud to announce a partnership with Microsoft Education. Microsoft has an incredible history of supporting technology in education, and is recognized as a leader in providing solutions for educators. Out of the 17,000 education apps on the Microsoft platform, MasteryConnect will be one of six that are highlighted at the upcoming Florida Educational Technology Convention (FETC) and in other presentations throughout the country. Here’s an awesome statement of support from the Microsoft VP of WW Education, Mr. Anthony Salcito (author of the widely-read DailyEdventures Blog). Check out the video below highlighting MasteryConnect on the Microsoft Surface Tablet. 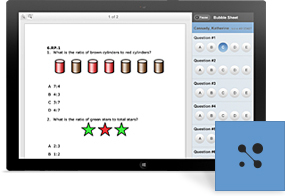 MasteryAssess is Microsoft’s Windows 8 Education App of the Week! The MasteryConnect assessment app “BubbleSheet” is getting a new name…MasteryAssess. We’ve launched this recent name change to the app alongside the release on the Windows 8 platform. The new MasteryAssess app is packed with improvements such as providing results immediately after submission of an assessment and support of technology enhanced items (TEI’s) – like drag and drop, inline choice, and other new enhanced item types. For teachers, the new Windows 8 Surface Pro tablets let you take advantage of all the features of MasteryConnect including GradeCam functionality for bubble sheet scanning right from the tablet’s built-in camera.